Beauty is in the eye of the beholder, as they say, so what you're about to see may have you gagging while your pal's salivating at the genius of these insane vehicle conversions. "I'm an eight-year-old kid trapped in an adult's body," said Jeff Block who built himself quite a contraption. He took the body of a Chevy Camaro, flipped it upside down and mounted it on the chassis of a Ford Fiesta, covering the Fiesta's wheels. Why? Because he wanted it to look like it was sliding down the road on its roof during the 24 Hour Of Lemons endurance race for cars that cost under 500 dollars to build. The rest of the vehicles on this list are just as outlandish and the people who built them (likely) just as nuts as Jeff. For instance, there are the two dudes who installed a fully-functional hot tub into a 1969 Caddilac Deville. They uprated the suspension to accommodate the weight of the water and installed a heater and filter for the water. Apparently, "you haven't really lived until you've sat in a hot tub and watched the world roll by." This does give a whole new meaning to the term 'car-pooling'. 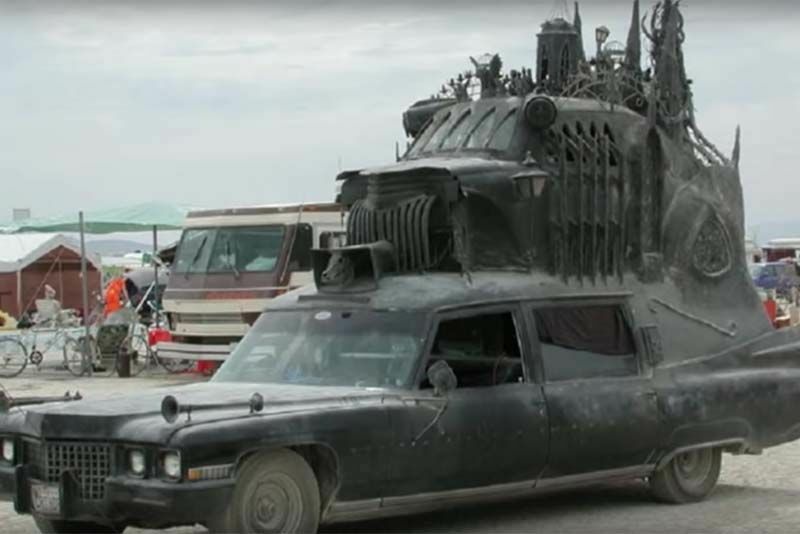 So, not that I've set the tone, click play below to see these and 13 other insane vehicle conversions that'll have you both horrified and inspired at the same time.